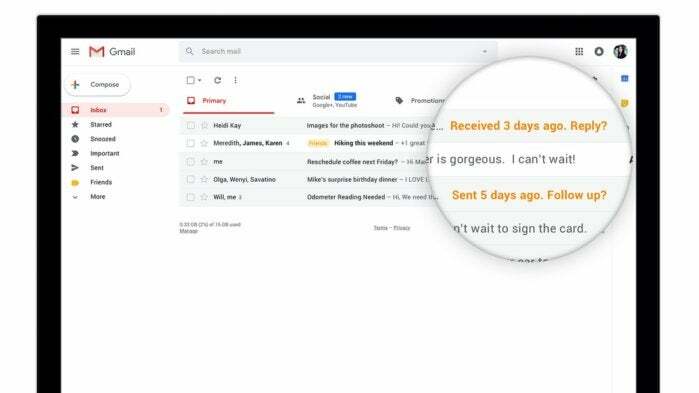 Just when you thought it had completely forgotten about the Gmail web client, Google has launched a brand new version, with a fresh design, new features, and a new way of thinking about email. As previously rumored, Google is rolling out a slew of interface and feature changes to the Gmail web client today, but as with all things web and Google, it may take a while to reach your browser. Right off the bat, you’ll notice a visual change with the new Gmail. While the old web interface was a bit long in the tooth, the new redesign gives it a more modern feel, with rounded buttons, cleaner menus, and collapsible side panels. But while the new interface is nice and intuitive, the biggest changes are in how you use it, not how it looks. The inbox on Gmail’s web client has gotten a major upgrade. Why this matters: More than a billion people use Gmail every day, and a large portion of those people use the web client to send and receive messages. Whether you’re using a Gmail account for work or personal use, having a safe, strong, and secure web client is as important as push notifications and scheduling, but the whole package here is a major upgrade for Gmail users, particularly confidential mode. Allowing people to remove the ability to forward, copy, download, and print messages, as well as set expiration dates will make Gmail that much more attractive to privacy-minded individuals and businesses. Along with the design overhaul, the new Gmail web interface brings a laser-sharp focus on productivity and security. It starts with your inbox. When a message or conversation has an attachment, you’ll now be able to preview or open it without needing to scroll through a list of messages, and an overdue snooze button lets you keep your inbox clean. You can also easily access Google’s other tools, such as Calendar, Keep, and Tasks, which has no been broken out into its own app on iOS and Android. A new feature will remind you to send replies to older messages. Even if you aren’t a habitual scheduler, the new Gmail will keep track of your messages for you with a new “nudge” feature that reminds you to reply to messages after they’ve been dormant for a few days. Additionally, smart replies have been integrated into Gmail on the web for faster responses. Of course you can always take a screenshot or snap a photo of the screen with your phone, but it’s a good safeguard nonetheless. You can also set an expiration date for messages, just like Inspector Gadget. The focus with the new Gmail update may be on the web interface, but Google hasn’t forgotten about its mobile apps. 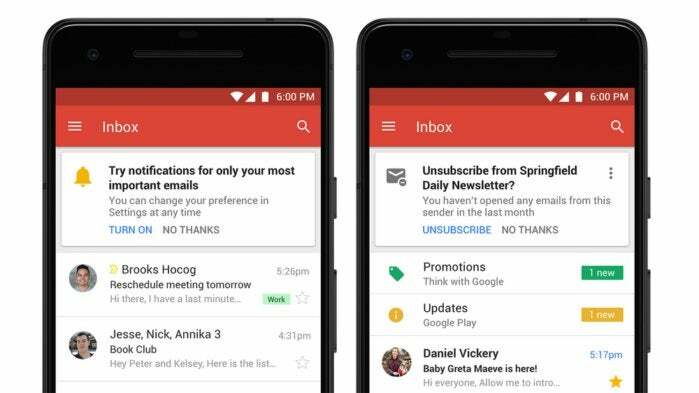 A new update to the iOS and Android Gmail app will bring high-priority notifications, which will notify you of important messages, and unsubscribe suggestions. Additionally, Gmail will now warn you when a suspected spam message comes through, just like your Pixel phone does with calls. The Gmail app is getting high-priority notifications and ubsubscribe suggestions. There’s also a new app for productivity, Tasks. Previously part of the Gmail experience, the new app offers a simple, straightforward interface that lets you create lists and schedule tasks, set reminders, and add subtasks and notes. It’s also integrated with Gmail and Calendar, so you can keep your whole life organized without jumping between apps. To get started with Tasks, you can download it from the App Store on iOS (available this week) or the Google Play store on Android. The new Gmail client is rolling out globally, with feature due to hit browsers within the next few weeks. To check to see if you have the update, click the gear icon in the right corner and look for the “Try the new Gmail” option.